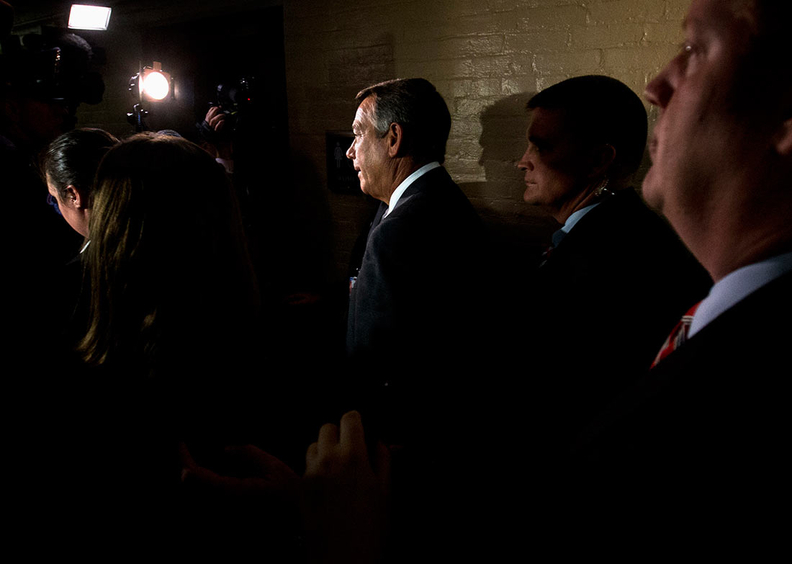 House Speaker John Boehner leaves a meeting with House Republicans announcing his resignation Friday. The House will likely carry on with its lawsuit against the Obama administration over the Affordable Care Act without John Boehner, who plans to step down as House speaker next month. But his resignation probably means that hopes for legislative tweaks to the law are dead for now. Boehner (R-Ohio) disclosed his plans first to fellow Republicans and then during a news conference Friday afternoon. The House's lawsuit against the Obama administration over the Affordable Care Act will likely move forward despite his surprise announcement Friday that he would resign at the end of October. Meanwhile, the lawsuit he and other House Republicans spearheaded continues to make its way through the courts. House v. Burwell accuses the Obama administration of spending money on the ACA's cost-sharing provisions without congressional appropriation. Millions of enrollees who meet certain income guidelines have reduced deductibles, copayments and coinsurance, and the government reimburses insurance companies for the assistance. That challenge is likely to continue at least for the time being, experts say. Boehner and other Republicans launched the lawsuit after they voted to approve a resolution in 2014 allowing it. That resolution vested control over the litigation in the speaker of the House, noted Nicholas Bagley, a law professor at the University of Michigan. “Unless Speaker Boehner pulls the plug on the litigation before he resigns, it'll be up to the next speaker to decide whether the case should continue,” Bagley wrote in an e-mail. Josh Blackman, an associate law professor at the South Texas College of Law, also said he doesn't think Boehner's resignation will make a difference when it comes to the lawsuit. A federal judge recently decided to allow the suit to move forward, saying the House has legal standing sue the Obama administration over the issue. The House argues it should be allowed to sue because the administration stole its constitutional power of the purse. The administration has countered that the courts shouldn't decide political battles and is seeking an immediate appeal of that preliminary decision. It's unlikely the next speaker will backtrack on the lawsuit. Rep. Kevin McCarthy (R-Calif.) is widely thought to be Boehner's likely successor, and McCarthy has been a vocal advocate of the litigation. But regardless of who replaces Boehner, his resignation likely signals an end to hopes of altering the Affordable Care Act while Obama is in office. Joe Antos, a health policy expert at the American Enterprise Institute, a center-right think tank, said there was an outside chance with Boehner as speaker that Congress could have worked out a deal with Obama to change some parts of the ACA. The new House leadership, however, will likely be less willing to compromise on Obamacare, Antos said. But Ronald Schurin, an associate professor in American government and politics at the University of Connecticut, said he doubts any changes would have been possible to the ACA even with Boehner. Schurin said changes are unlikely until there's a new president in the White House. Boehner said little Friday about his reasons for leaving. But an upcoming vote on the budget was likely to worsen the longstanding tension between the speaker and the party's more conservative members. Conservative Republicans moved to defund Planned Parenthood after the release of videos that they say show Planned Parenthood officials discussing the sale of fetal remains. Planned Parenthood has denied the allegations and maintains that the videos were heavily edited and reflect officials talking about fetal tissue donations for research. The proposal to eliminate funding for Planned Parenthood would likely have led to a stalemate in Congress. Failure to pass at least a continuing budget resolution by the end of this month would have led to a government shutdown. Dissatisfied with Boehner, some conservative Republicans had reportedly threatened to force a vote to remove Boehner as speaker. After Boehner announced his resignation, House Republicans said there was agreement to pass a spending bill that would keep the government open through mid-December without defunding Planned Parenthood, the Washington Post reported. The Planned Parenthood issue may come up again when lawmakers consider budget reconciliation legislation, the Post reported. Boehner was in an intractable position because he opposes abortion but had no interest in forcing another government shutdown, said Todd Rehm, a Republican strategist and editor of GAPundit.com. “It highlights the competing interests of Republican leadership, both allowing their members to make good on the promises they've made and the principles they've held while still passing a budget and still keeping doors open,” Rehm said. The issue is likely the straw that broke the camel's back after years of criticism from the party's right flank about Boehner's leadership. “To get to the point where a single issue is enough for somebody like John Boehner to leave Congress requires a great deal of strain being placed on him,” Rehm said. Rehm said Boehner's resignation may shift more attention in coming weeks to House Budget Committee Chairman Tom Price (R-Ga.), who will be central in budget discussions and has aspirations to join the House leadership. Renee Unterman, a Georgia state senator and chair of the state senate's health and human services committee, said it's rumored that Price, a fierce opponent of the ACA, would like to be House majority leader. Unterman said Price, a former orthopedic surgeon, would bring valuable healthcare experience to the role. “Having someone with his knowledge coming up through the ranks not only in politics but also in medicine is definitely a plus,” Unterman said.